The Dream of Gerontius is Newman’s longest poem, composed in 1865, almost twenty years after his entrance into full communion with the Roman Catholic Church. 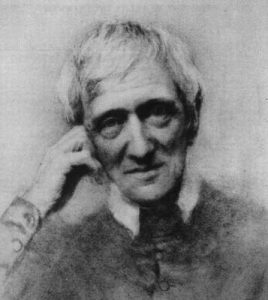 Newman once humbly remarked to a friend that “It was written by accident – and it was published by accident.” It was actually the fruit of years of study and prayer during which he came to accept a Catholic understanding of the doctrine of Purgatory and the practice of praying for the deceased as well as the intercession of the saints, especially the Virgin Mary, and the angels. The Dream of Gerontius expresses in poetical form many truths of Catholic dogma concerning creation, redemption and eschatology. The poem can be divided into three parts. In the first Gerontius who is dying asks for prayers; in the second, Gerontius’ soul meets its guardian angel and is tempted by demons; in the third the soul approaches God’s throne and judgment before going to Purgatory. The poem opens with an old man (Gerontius, the Latin word derived from the Greek geron for old man) experiencing the loss of life. Gerontius asks for prayer from his friends. He is aware that death has come to visit him. He feels the finiteness and weakness of the body and human life. “Prepare to meet thy God.” This is Newman’s invitation to the reader, and to each one us: think of death and judgment; think of Jesus the Just and Merciful Savior. This is so insightful and beautiful. It touched my soul very deeply. On the verge of Thanksgiving, and poised at the brink of Advent, what a perfect meditation to help us value every moment as the gift it is. We will one day lose this temporal existence and prepare to meet God; what will we do with our time until then? How will we practice abandonment and the death of self, so that our final moments will be sweet and natural, a falling into God’s arms? How appropriate is the meditation on the Dream of Gerontius approaching death, as we reach the end of another Liturgical Year, and of the Year of Mercy! Even nature itself seems to reminds us of the end of days, but also gives us hope of future glory and of the mercy of God since we also hope that Spring will return again in full bloom! We all have to come to grip with our end of life issues and try to be prepared… because we don’t know the day nor the hour. Blessed Newman expressed it so beautifully in the poem! I found much similarity with Dante’s Divine Comedy! Lord, have mercy on us! Mother Mary and all the Angels and Saints, intercede for us! All you friends of the Lord, pray for us!